본 발명은 MMT(MEPG MEDIA Transport)에 관한 것으로, 특히 MEPG MEDIA Transport에서 MMT Asset(컨텐츠) 및 MMT Item(서비스)에 대한 정보를 제공하는 방법에 관한 것이다. The present invention relates to a method of present invention relates to (MEPG MEDIA Transport) MMT, especially in MEPG MEDIA Transport provides information on the MMT Asset (content) and MMT Item (service). 본 발명에 따르면 시스템에서 멀티미디어 컨텐츠를 제공하는 방법에 있어서, 상기 멀티미디어 컨텐츠를 획득할 수 있는 정보를 정의하는 동작; A method for providing multimedia contents in a system according to the present invention, the operation to define the information to obtain the multimedia content; 및 상기 정보를 전송하는 동작을 포함하되, 상기 정보는 상기 멀티미디어 컨텐츠의 구성 정보를 지시하는 정보 테이블을 포함하고, 상기 정보 테이블은 상기 테이블의 테이블 아이디 및 상기 테이블의 버전 정보를 포함하는 방법이 제공된다. And the information table comprising the operation of transmitting the information, the information comprises a table of information that indicates the configuration information of the multimedia contents, it is provided a method comprising a table ID and the version information of the table of the table do. 본 발명은 MMT(MEPG MEDIA Transport)에 관한 것으로, 특히 MEPG MEDIA Transport에서 MMT Asset(컨텐츠) 및 MMT Item(서비스)에 대한 정보를 제공하는 방법에 관한 것이다. The present invention relates to a method of present invention relates to (MEPG MEDIA Transport) MMT, especially in MEPG MEDIA Transport provides information on the MMT Asset (content) and MMT Item (service). 하이브리드(Hybrid) 망과 하이브리드 컨텐츠(Hybrid content)를 제공하려 하는 근래의 멀티미디어 서비스에서는 각 컨텐츠 및 서비스의 상호 관계에 대한 정보를 제공해 줄 수 있는 방법이 필요하나 현재는 그러한 방법이 존재하지 않는다. In recent years, multimedia services that attempt to provide a hybrid (Hybrid) network and the hybrid content (Hybrid content) one needs a way to provide information about the relationship between each of the content and services currently do not exist in that way. 본 발명이 해결하려는 과제는 MMT에서 서비스 및 컨텐츠에 대한 정보를 제공할 수 있는 방법을 제공하는 것이다. The challenge is to solve the present invention to provide a method which can provide information about its services and content in MMT. 본 발명은 MMT에서 새로운 테이블을 정의하여, 서비스 및 컨텐츠에 대한 정보를 제공할 수 있는 방안을 제안한다. The present invention is to define a new table in the MMT, it proposes a scheme capable of providing information on the service and content. 또한 본 발명은 상기 서비스 및 컨텐츠에 대한 정보의 습득을 용이하게 하는 방법을 제공한다. In another aspect, the present invention provides a method that facilitates the acquisition of information about the services and contents. 또한 본 발명은 상기 서비스 및 컨텐츠를 획득할 수 있는 정보를 제공하는 방법을 제공한다. In another aspect, the present invention provides a method of providing information to obtain the service and content. 또한 본 발명은 상기 서비스 및 컨텐츠를 이용할 수 있는 단말기의 요구조건 정보를 제공하는 방법을 제공한다. In another aspect, the present invention provides a method of providing the information requirements of the devices with access to the service and content. 또한 본 발명은 시스템내의 특별한 기능들에 대한 정보를 제공할 수 있는 방법을 제공한다. In another aspect, the present invention provides a way to provide information about the special features in the system. 본 발명에 따르면 MMT에서 새로운 테이블을 정의하여, 서비스 및 컨텐츠에 대한 정보를 제공할 수 있다. In accordance with the present invention by defining a new table in the MMT, it is possible to provide information on the service and content. 또한 본 발명에 따르면 상기 서비스 및 컨텐츠에 대한 정보의 습득을 용이하게 하고 상기 서비스 및 컨텐츠를 획득할 수 있는 정보를 제공할 수 있다. According to the present invention it can also provide information that can facilitate the acquisition of information on the service and content, and acquires the service and content. 또한 본 발명은 상기 서비스 및 컨텐츠를 이용할 수 있는 단말기의 요구조건 정보와 시스템 내의 특별한 기능들에 대한 정보를 제공할 수 있다. In another aspect, the present invention may provide information for the particular function within the system requirement information of a terminal that can use the service and content. 이하, 본 발명의 바람직한 실시 예들의 상세한 설명이 첨부된 도면을 참조하여 상세히 설명한다. With reference to the drawings a detailed description of the preferred embodiments of the present invention will be described in detail with the accompanying. 도면들 중 동일한 구성들은 가능한 한 어느 곳에서든지 동일한 부호들을 나타내고 있음을 유의하여야 한다. The same configuration of the figures should be noted that represents the same reference numerals even though where possible. 또한, 하기 설명에서는 구체적인 특정 사항들이 나타내고 있는데, 이는 본 발명의 보다 전반적인 이해를 돕기 위해서 제공된 것일 뿐 이러한 특정 사항들 없이도 본 발명이 실시될 수 있음은 이 기술 분야에서 통상의 지식을 가진 자에게는 자명하다 할 것이다. Further, explaining the there shown are specific particular locations, which is that the invention be as without these specific details provided can be carried out to assist the overall understanding of the present invention are apparent to those of ordinary skill in the art it will be. 그리고 본 발명을 설명함에 있어, 관련된 공지 기능 혹은 구성에 대한 구체적인 설명이 본 발명의 요지를 불필요하게 흐릴 수 있다고 판단되는 경우 상세한 설명을 생략한다. And in the following description of the present invention, a detailed description of known functions and configurations that are determined to unnecessarily obscure the subject matter of the present invention and detailed description thereof will not be given. 레이어 C는 MME Asset delivery, MMT Item delivery 및 MMT Encapsulator delivery를 제어하고, MMT Item 소비를 위해 요구되는 모든 정보와 기능들을 제공한다. Layer C provides all information and functionality that controls the MME Asset delivery, MMT Item delivery and MMT Encapsulator delivery and demand for MMT Item consumption. 레이어 C에 의해 제공되는 기능들은 다음과 같다. Functions provided by the layers C are as follows. Information Table Provision : 다양한 정보 테이블은 MMT Item 소비를 위해 요구되는 정보를 제공한다. Information Table Provision: various information tables provide the information required for the MMT Item consumption. Connection Management : MMT Encapsulator를 위한 efficient QoE를 레이어 T를 제어하고 MMT 서버와 MMT 클라이언트간의 점 대 점 연결을 제공한다. Connection Management: to the efficient QoE for MMT Encapsulator control layer T and provides a point-to-point connection between the server and the MMT MMT clients. 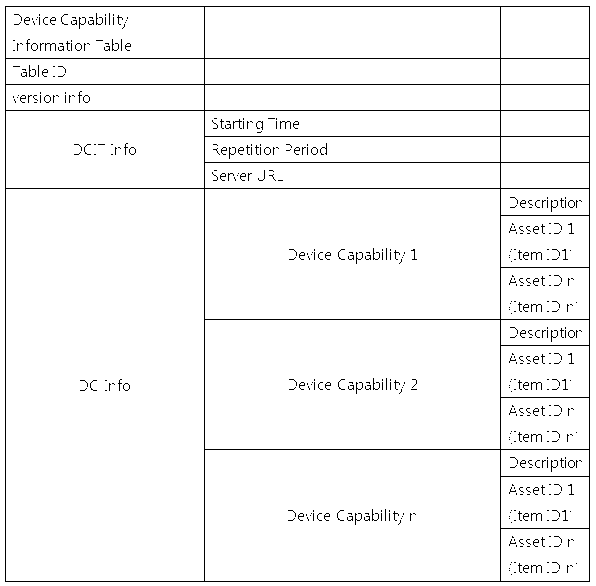 Device Capability Management : Static device capability information를 제공하고, Dynamic Device Capability를 모니터링 하며, 소프트웨어, 펌웨어와 어플리케이션을 관리한다. Device Capability Management: provides a Static device capability information and monitoring Dynamic Device Capability and manage the software, firmware, and applications. System Specific Function Provision : 몇몇 시스템은 MMT Item consumption을 위해 요구되는 선택적인 기능을 가질 수 있다. System Specific Function Provision: Some systems may have an optional capability that is required for MMT Item consumption. 전형적인 예들은 Audience Measurement Function과 Downloadable DRM function이다. Typical examples are the Audience Measurement Function and Downloadable DRM function. Layer C data generation : 레이어 C는 레이어 T에 의해 전송되는 데이터를 가진다. Layer C data generation: the layer C has a data to be transmitted by the layer T. 그들은 Information Table, Device capability management를 위한 커멘드, 그리고 system specific function으로부터의 데이터이다. They are the data from the command, and the system specific function for the Information Table, Device capability management. Session Management : MMT T Frame을 위한 efficient QoS를 제공하기 위해 레이어 T를 제어한다. It controls the layer T to provide efficient QoS for MMT T Frame: Session Management. Hybrid Network Synchronization : 하이브리드 네트워크 딜리버리를 위한 동기 정보를 제공한다. Hybrid Network Synchronization: providing synchronization information for the hybrid network delivery. 다음으로 레이어 C1의 동작과 레이어 C2의 동작을 설명한다. Next, the operation of the operation of the layers C1 and C2 layer. 레이어 C1은 MMT Item consumption, connection management의 기능, Device capability management, system specific information 그리고 security을 위한 정보 테이블들을 제공한다. Layer C1 provides the information table for the MMT Item consumption, connection management function, Device management capability, system specific information and security. MPEG2 TS는 프로그램 정보를 위한 5개의 서로 다른 테이블들을 가진다. MPEG2 TS has the five different table for the program information. 그들은 PMT, PAT, CAT, NIT 그리고 TDT이다. They PMT, PAT, CAT, NIT and TDT. TS가 처음으로 디자인되었을 때에는, 이들 5개의 테이블로 충분하였다. When TS is the first time the design was good enough to these five tables. 그러나 하이브리드 네트워크 환경과 하이브리드 컨텐츠 소비 환경을 고려하면, 이들 테이블들이 확장될 필요가 있다. However, when considering a hybrid network environments and hybrid content consumption environment, these tables are to be expanded. 게다가 하이브리드 컨텐츠 소비를 위한 새로운 테이블들이 요구된다. In addition to the new hybrid table for content consumption it is required. TDT는 재사용될 수 있다. TDT can be reused. MACIT는 MMT Asset을 위한 정보를 제공하며 PMT와 유사하다. MACIT provides information for MMT Asset and is similar to PMT. MACIT와 PMT의 차이점은, MACIT는 어플리케이션과 웹 페이지들을 포함하는 asset의 다양한 범위와 MMT Asset comsuption를 위해 요구되는 device capabilities를 제공한다는 것이다. PMT is the difference between MACIT, MACIT is that it provides a device capabilities required for a wide range of asset and MMT Asset comsuption including their applications and Web pages. MACIT는 다음 표 1과 같다. MACIT are given in Table 1. 표 1에는 더 많은 필드들이 추가될 수 있다. Table 1 can be added to many more fields. 표 1에서 Table ID는 MACIT의 아이디이고, Version은 MACIT의 버전이고, MACIT Transmisison Time Info는 MACIT 전송 시작 시점과 반복 주기에 관한 정보를 제공한다. Table 1 Table ID is the identity of the MACIT, Version is the version of MACIT, MACIT Transmisison Time Info provides information about the cycle repeats and MACIT transmission start time. MMT ASSET ID는 MACIT에 관한 정보에 매핑된다. MMT ASSET ID is mapped to the information on MACIT. Required Device Capabilities는 MMT Asset 소비를 위해 요구되는 디바이스의 능력들이다. Required Device Capabilities are the capabilities of the device required for the MMT Asset consumption. Component Relation Info는 MMT Asset내에 있는 component들의 관계를 설명한다. Component Relation Info will be described the relationship of the component in the MMT Asset. Component Info는 MMT Asset 내에 있는 n개의 component들에 관한 정보이다. Component Info is information regarding the n component in the MMT Asset. MICIT는 MMT Item들을 위한 정보를 제공하며 PAT와 유사하다. MICIT provides information for MMT Item, and is similar to the PAT. MICIT와 PMT와의 차이점은, MACIT는 하이브리드 서비스 타입의 MMT Item을 제공하기 위해 Asset들간의 관련 정보를 제공한다는 것이다. PMT is the difference between MICIT, MACIT is that it provides relevant information between Asset to provide MMT Item of the hybrid type of service. MICIT는 표 2와 같으며, 더 많은 필드들이 추가될 수 있다. MICIT is as shown in Table 2, there are more fields it can be added. *표 2에서 Table ID는 MICIT의 아이디이고, Version은 MICIT의 버전이고, MICIT Transmission Time Info는 MICIT 전송 시작 시점과 반복 주기에 관한 정보를 제공한다. 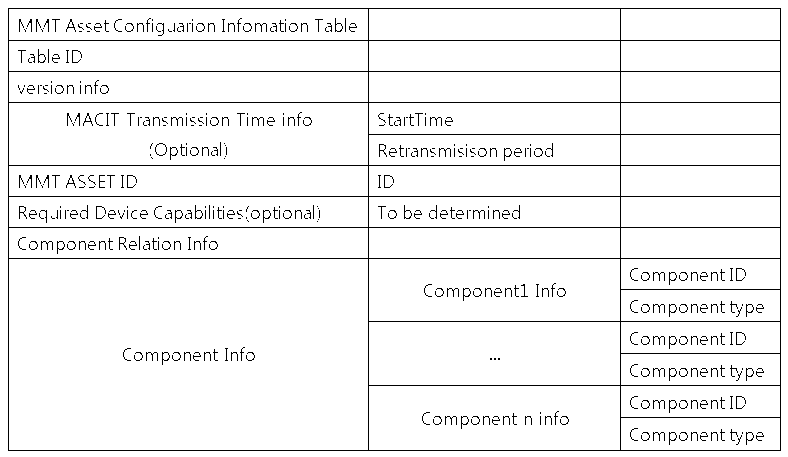 * Table 2 Table ID is the identity of the MICIT, Version is the version of MICIT, MICIT Transmission Time Info provides information about the cycle repeats and MICIT transmission start time. MMT ITEM ID는 MICIT에 관한 정보에 매핑된다. MMT ITEM ID is mapped to the information on MICIT. Required Device Capabilities는 MMT Item 소비를 위해 요구되는 디바이스의 능력들이다. Required Device Capabilities are the capabilities of the device required for the MMT Item consumption. Asset Relation Info는 MMT Item 내에 있는 MMT Asset들의 관계를 설명한다. Asset Relation Info will be described the relationship of MMT in the MMT Asset Item. Asset Info는 MMT Item 내에 있는 n개의 Asset들에 관한 정보이다. Asset Info is information regarding the n Asset Item in the MMT. SICIT는 모든 정보 테이블들의 정보를 제공한다. SICIT provides information on all the information table. SICIT를 가지고, MMT 디바이스는 어떤 정보 테이블들이 전송될지 또는 어떤 정보 테이블들이 업데이트될지를 쉽게 체크한다. Have SICIT, and MMT device is easy to check whether any information tables are transmitted or whether any information tables are updated. SICIT는 표 3과 같으며, 더 많은 필드들이 추가될 수 있다. SICIT is as shown in Table 3, there are more fields it can be added. 표 3에서 Table ID는 SICIT의 아이디이고, Version은 SICIT의 버전이고, SICIT Info는 SICIT 전송 시작 시점과 반복 주기에 관한 정보를 제공하고, 디바이스가 interaction network를 통해 접속할 수 없을 때 SICIT의 위치를 제공한다. 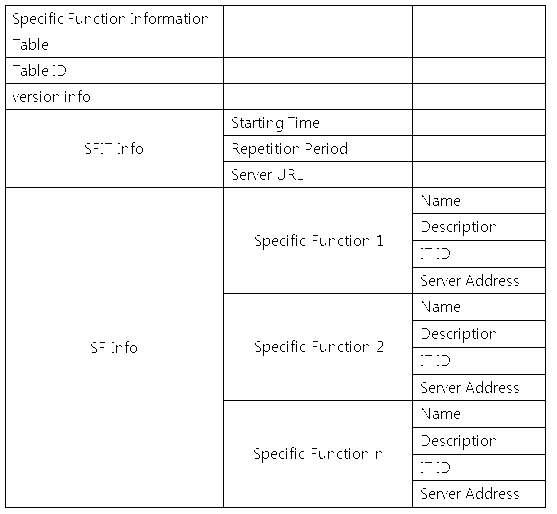 Table 3 Table ID is the ID of the SICIT, Version is the version of SICIT, SICIT Info provides information on the repetition period and SICIT transmission start time and, when the device is accessible through the interaction network to provide the location of the SICIT do. Information Table Info는 그것들 모두에 관한 정보를 제공한다. Information Table Info provides information about all of them. Information table들 각각은 IT ID, version, IT transmission time, IT repetition period, IT access location 그리고 IT access 2 nd location으로 구성된다. 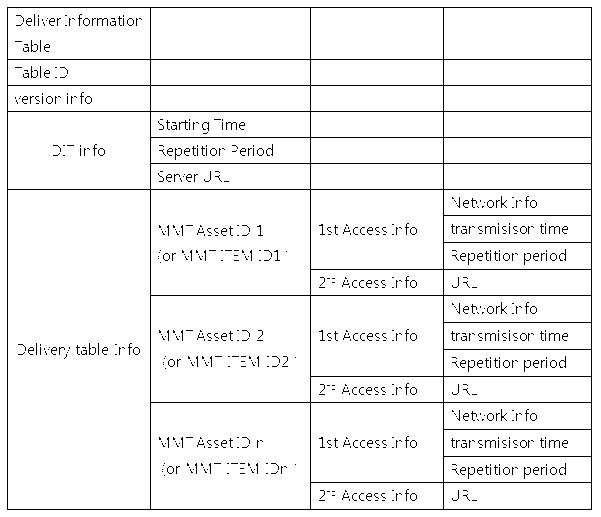 Each of Information table is composed of IT ID, version, IT transmission time , IT repetition period, IT access location and access IT 2 nd location. 2 nd location에 대해, 디바이스는 interaction network를 통해 접속할 수 있다. For the 2 nd location, the device can be connected via the interaction network. DIT는 MMT Asset들과 MMT Item들에 관한 delivery 정보를 제공한다. DIT provides information about the delivery of MMT Asset and MMT Item. DIT는 특히 MMT Asset들과 MMT Item들이 방송망을 통해 전달될 때 매우 유용하다. DIT is very useful, especially when they MMT Asset and MMT Item will be delivered over the network. DIT Type 1은 MMT Asset 및/또는 MMT Item 측면에서의 전달 정보를 제공하고, DIT Type 2는 네트워크측면에서의 전달정보를 제공한다. DIT Type 1 provides the transmission of information from the MMT Asset and / or MMT Item side and, DIT Type 2 provides a transfer of information from the network side. DIT는 표 4 및 표 5와 같으며, 더 많은 필드들이 추가될 수 있다. DIT is as shown in Table 4 and Table 5, there are more fields it can be added. 표 4에서 Table ID는 DIT의 아이디이고, Version은 DIT의 버전이고, DIT Info는 DIT 전송 시작 시점과 반복 주기에 관한 정보를 제공하고, 디바이스가 interaction network를 통해 접속할 수 없을 때 DIT의 위치를 제공한다. 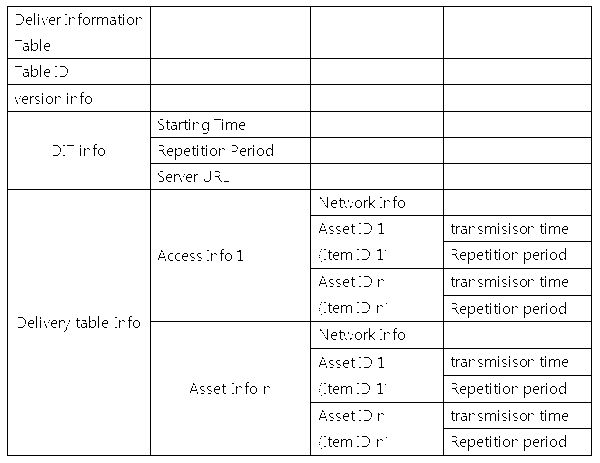 Table 4 Table ID is the ID of the DIT, Version is the version of the DIT, DIT Info provides the location of the DIT when there is no available information on the repetition period and the beginning DIT transmission time, and the device can be connected via the interaction network do. Delivery Table Info는 각각의 MMT Asset 또는 MMT Item에 접속하기 위한 정보를 제공한다. Delivery Info Table provides information for connecting to each of the MMT or MMT Asset Item. 각각의 MMT Asset 또는 MMT Item에 대해 두 개의 서로 다른 접속 정보가 제공된다. Two different contact information is provided for each of the MMT or MMT Asset Item. 첫 번째 정보는 MMT Asset 또는 MMT Item이 방송망을 통해 전달될 때 사용되고, 두 번째 정보는 MMT Asset 또는 MMT Item이 interaction network를 통해 전달될 때 사용된다. The first information is the MMT or MMT Asset Item used as it passes through a broadcasting network, the second information is used as it passes through the MMT or MMT Asset Item This interaction network. 표 5에서 Table ID는 DIT의 아이디이고, Version은 DIT의 버전이고, DIT Info는 DIT 전송 시작 시점과 반복 주기에 관한 정보를 제공하고, 디바이스가 interaction network를 통해 접속할 수 없을 때 DIT의 위치를 제공한다. 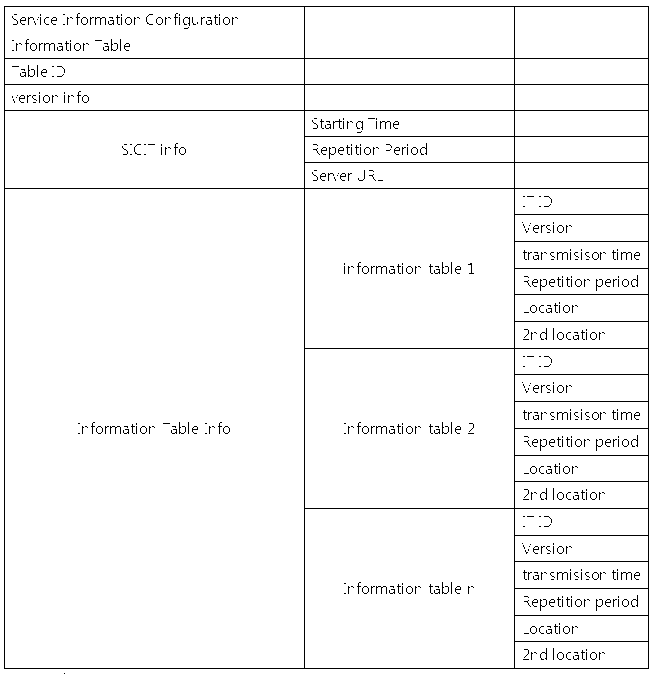 Table 5 Table ID is the ID of the DIT, Version is the version of the DIT, DIT Info provides the location of the DIT when there is no available information on the repetition period and the beginning DIT transmission time, and the device can be connected via the interaction network do. Delivery Table Info는 디바이스가 MMT Asset 또는 MMT Item의 셋에 접속할 수 있는 네트워크에 관한 정보를 제공한다. 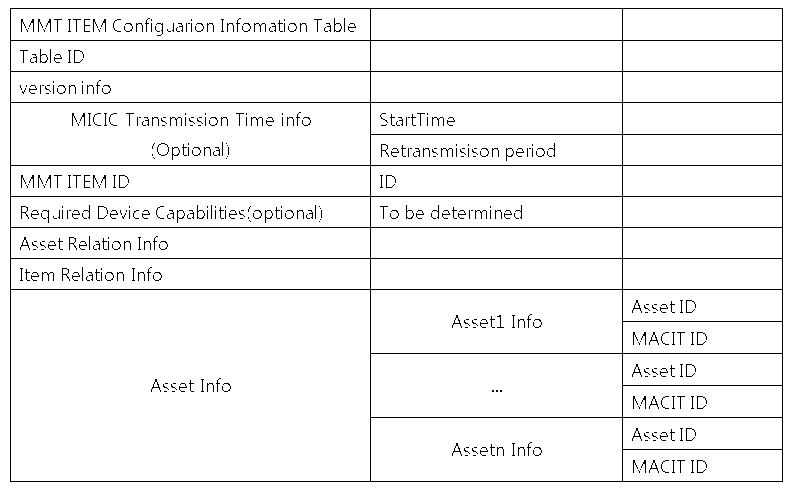 Delivery Table Info provides information about the network that the device can connect to three of MMT Asset or MMT Item. 각각의 MMT Asset 또는 MMT Item는 그것 자신의 전송 시작 시간과 반복 시간을 가진다. Each of the MMT Asset or MMT Item has its own transmission start time and repetition time. SFIT는 MMT에 관한 specific function information를 제공한다. SFIT provides the specific function information about the MMT. 각각의 MMT 서버는 서버를 위해 사용되는 specific function을 가질 수 있다. MMT each server may have a specific function to be used for the server. 모든 specific function들의 정보는 SFIT에 의해 제공된다. Information of all the specific function is provided by the SFIT. specific function의 전형적인 예는 CAS 또는 DRM과 같은 audience measurement와 security이다. Typical examples of the specific function is the audience measurement and security, such as CAS or DRM. SFIT는 표 6과 같으며, 더 많은 필드들이 추가될 수 있다. SFIT is as shown in Table 6, there are more fields it can be added. 표 6에서 Table ID는 SFIT의 아이디이고, Version은 SFIT의 버전이다. Table 6 Table ID is the identity of the SFIT, Version is the version of the SFIT. SFIT Info는 SFIT의 전송 시작 시간과 반복 주기를 제공하며, 디바이스가 interaction network를 통해 접속할 수 없을 때 SFIT의 위치를 제공한다. SFIT Info provides a transmission start time and repetition period of SFIT, when the device is accessible through the interaction network provides the position of the SFIT. SF Info는 specific system을 위해 요구되는 specific fuctions에 관한 정보를 제공한다. SF Info provides information about the specific fuctions required for a specific system. 각각의 specific function 필드는 name, functionalities, 관련 IT ID 그리고 specific function의 서버 주소를 제공한다. Each specific function field provides an address of the server name, functionalities, and related IT ID specific function. DCIT는 MMT Asset과 MMT Item 셋을 위한 common device capability information을 제공한다. DCIT provides a common device capability information for MMT Asset and MMT Item three. DCIT가 사용될 때, MACIT와 MICIT는 요구되는 device capability information을 가지지 않을 수 있다. When DCIT is used, MACIT MICIT and may not have the device capability information as required. DCIT는 표 7과 같으며, 더 많은 필드들이 추가될 수 있다. DCIT is as shown in Table 7, there are more fields it can be added. 표 7에서 Table ID는 DCIT의 아이디이고, Version은 DCIT의 버전이다. Table 7 Table ID is the identity of the DCIT, Version is the version of DCIT. DCIT Info는 DCIT의 전송 시작 시간과 반복 주기를 제공하며, 디바이스가 interaction network를 통해 접속할 수 없을 때 DCIT의 위치를 제공한다. DCIT Info provides a transmission start time and repetition period of DCIT, when the device is accessible through the interaction network provides the position of the DCIT. SF Info는 Assets 또는 Items 셋을 위한 common device capabilities 에 관한 정보를 제공한다. SF Info provides information about common device capabilities for Assets Items or three. 미디어 컨텐츠에 대한 정보를 제공하는 방법. To provide information about the media content.